Thanks to the wonderful people at Denise Interchangeable Knitting & Crochet I had the pleasure of trying out the Denise Interchangeable Crochet Kit. And I liked it so much that I wanted to share my experience with all of you! In order to use the hook, you just attach the desired size crochet hook to a cord connector and then to the desired length of cord. Then, you are all set to crochet. I really enjoyed using this kit!! It was nice having so many sizes right at my fingertips. I like how the hook is made out of a smooth plastic that glides right through the stitches without catching. For basic crocheting, I just used the 3 in. cord. My first thought was that having the cord attached would bother me, or “get in the way”, but actually, it worked just fine. In fact, I liked that the cord made the hook a little more flexible. While this kit works well for “regular” crocheting, it really shines for Tunisian crochet!! If you like to Tunisian crochet, then this kit is a must have! Just pick out the hook size and length of cord you need and you have a Tunisian hook. The kit can also be used for Knooking and can be used interchangeably with the parts from the Denise Interchangeable Knitting Kit. You can do so much with this kit! I even used the pieces to create my own stitch holder so that my work wouldn’t unravel in my bag. All in all, I think the Denise Interchangeable Crochet Kit is a great product with so many uses!! I would highly recommend it! All Denise products are 100% Made in the USA! That means every single part and even the molds to make those parts!! 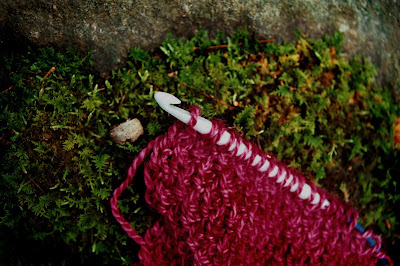 All of the Denise knitting and crochet parts are guaranteed for life!! The people at Denise are committed to maintaining a zero-landfill environment. Their recycling efforts go well beyond what is considered standard. The Denise Pink Project has raised $159,586 (as of 2/1/12) for breast cancer research. The Denise products pass through airport security in the US and most European countries. 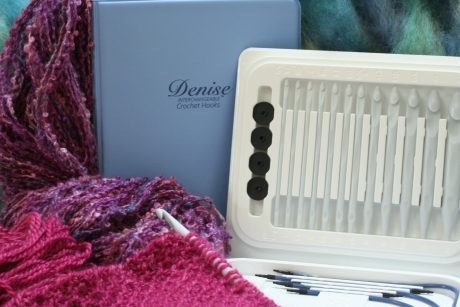 The Denise Interchangeable Crochet Kit can be purchased directly through Denise’s website, at many local yarn stores, or by clicking here. 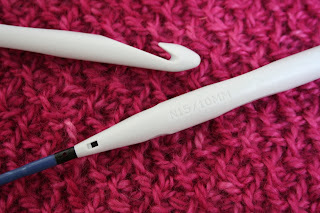 Thanks for posting this review, I was actually unaware their was an interchangeable crochet kit! I just wanted to say that I have the Denise interchangeable knitting set, and it is just as amazing, it was truly ridiculous trying to get through projects before I got it. Perhaps I’ll give this one a try too!